STOP what you are doing and come to our February TAPpy Hour with a MISSION because this party is a GO! 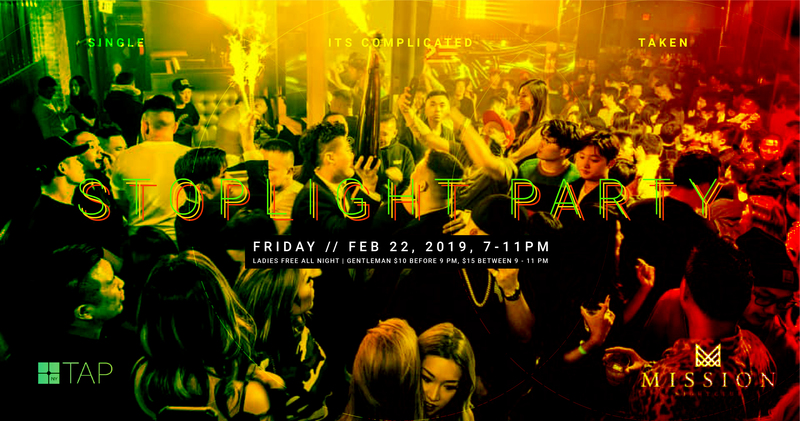 In an exclusive special, TAP-NY presents our very first Stoplight Party at Mission, the hottest club in K-Town! With a subtle nod to Valentine’s Day and our upcoming speed dating event, we’ll be distributing three different colored glow sticks that signify your relationship status. We will have exclusive access to the space beginning at 7 PM, so come early to grab some drinks with your favorite TAP members and kick off your weekend with a bang. TAPpy Hours are a great social opportunity to make genuine relationships and meet other members of the community, learn more about upcoming events, and get involved. Our events are 100% inclusive to everybody, regardless of background, so don’t be a stranger! We’re always on the lookout for wonderful volunteers to help us at our events – if interested, please sign up on our form HERE. *There is mandatory $4 coat check, including large bags/backpacks. We will be enforcing a smart casual dress code so please dress accordingly.